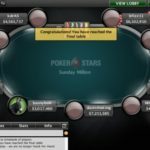 A pro poker player from Argentina named Vilactes has won the latest edition of $215 buy in No Limit Hold’em Sunday Million event, played at 8/7/16 on PokerStars. The winner took home a handsome amount of $131,000. The event is one of the most popular at the internet. 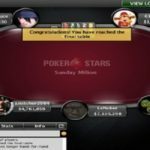 The event received 5,383 entries and generated a cash prize pool of amount $1,076,600, which was distributed to top 764 finishers of the game. Sea#1,seat32 and seat#3 of Sunday Million Final table were for $trateGema, A player from Germany with total 6,155,331 chips, Anton “ekziter” Astapau from Belarus with total 6,940,156 chip counts, and kalaloom of Estonia who had 3,186,241 chip counts along with him. Seat#4, seat#5 and seat#6 were for German boahgerding (8,557,560), João Mathias “joaoMathias” Baumgarten from Brazil (3,813,952), and Re8uZ from Former Yugoslav Republic of Macedonia) — 7,119,780. Seat#7, seat#8 and seat#9 belongs to players named as Argentinean Vilactes, who had 3,741,359, kdrAS from Brazil (8,214,539) and scalpel from Canada 6,101,082. First elimination from the final table was of Estonian kalaloom, who made $8,504 from the tournament and finished his journey at ninth position, just after 20 minutes of the game took place. Brazilian João Mathias “joaoMathias” Baumgarten, hit the rail after five minutes and was able to collected $12,205 being eighth position holder. Then goes Anton “ekziter” Astapau from Belarus playing against his opponents. 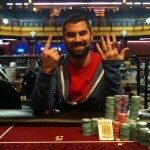 He played well but could not kept the momentum and got out with total winning share of amount $17,517. A couple more got busted from the table and they were Re8uZ ($25,140, being sixth, and scalpel ($36,082) at fifth position. 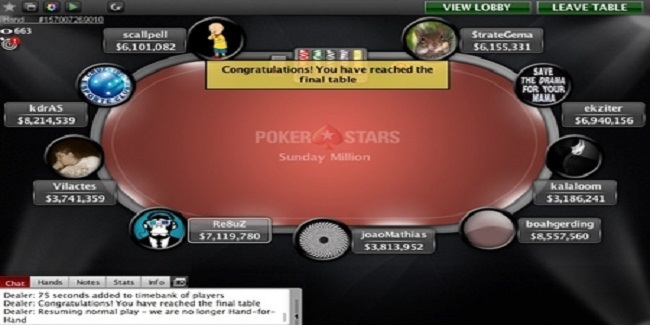 The game was in 13th hour of play and just after a few hands a German player named boahgerding hit the rail to fourth position and collected $51,784. The five community cards were T♣Q♣2♦2♣T♠. Another German player named $trateGema finished for third position and pocketed $93,070. 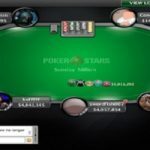 The heads up round was in between Vilactes(32,295,049 chips) and kdrAS (21,534,951 chip counts) but at last Vilactes becomes the winner for $131,000, whereas kdrAS collected $110,000, being the runner up.